Like a dagger crossing the waters, Estaca de Bares divides the ocean in two, the Atlantic on one side and the Cantabrian Sea on the other. Each cape of the Galician coast has its distinctive spirit and this one is no exception, for both its landscape and history. Estaca de Bares is the northernmost place of all the Iberian Peninsula and one of those key geographical points that all Spanish students learn about. It is part of Mañón, a municipality located on the banks of the River Sor and full of beautiful natural enclaves and small towns such as O Barqueiro or Bares, which retain all the charm of the old maritime towns. The cape, frequently whipped by the northeast wind, is an authentic sanctuary for birds. 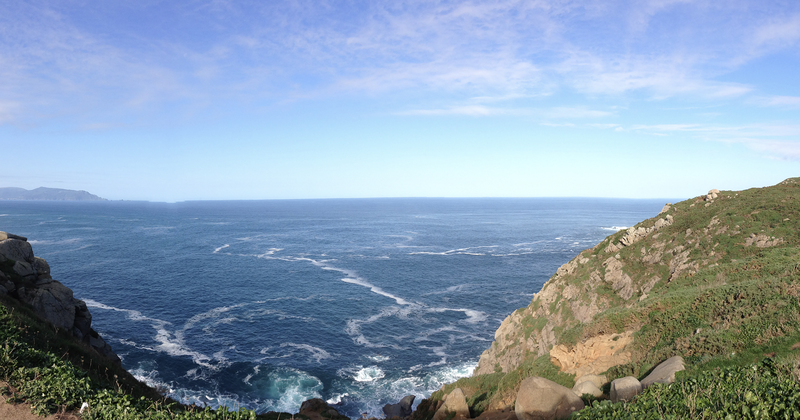 Hundreds of thousands of them (gannets, shearwaters, seagulls…) live here or cross the area in their migrations. On either side of the divide stretches an abrupt and wild coast. Facing north you will find the Viveiro estuary to the right and Ortigueira to the left, with Cape Ortegal, in many ways similar to Estaca de Bares, closing the line on the horizon. At the end of the cape is the lighthouse, a structure built in 1850, the time when measures started to be taken to mitigate the roughness of Galicia’s north coast. At its foot begin several paths that lead almost to the very edge of the cliff, passing by an old signal tower. A strong wind, of an indescribable salty smell, is guaranteed. Near the lighthouse, walking east on the narrow coastal road, some abandoned buildings will catch the traveller’s eye. This is the so-called American base of Bares, in reality a broadcast station for the LORAN navigation system, precursor to the GPS and guide to US military ships and aircraft for decades. The base operated between 1961 and 1991 and its inhabitants, at first Air Force and later US Navy soldiers, introduced the area to symbols of modernity such as blue jeans or rock music. They are still remembered in many localities in the area, from Ortigueira to Viveiro. A little further on, away from the road that connects the lighthouse with Porto de Bares, lies another building, known as “o semáforo”, the traffic light. It is an old observation and signalling post from the nineteenth century which attempted to warn ships, through the use of flags, to the dangers of approaching the coast. It has now been converted into a hotel. Estaca de Bares still holds one more architectural surprise, this time at its highest point. It’s what’s known as Garita de Bares (the bartizan of Bares), an old lookout post located on the highest part of the cape. It is somewhat complicated to reach, as it is accessed through a narrow, and pretty wrecked track, but it is worth trying: the views from there are spectacular, with the lighthouse and the American base at the edge of the land, the sea splashing at either sides and the birds crossing the air at full speed.